WASHINGTON — The White House announced parting protections for the northern reaches of Alaska's lands and waters on Friday, closing off more than 40,000 square miles of Bering Strait-area waters to future oil leases and requiring the federal government to set up a system for increasing the input of Native people. The lame-duck move was anticipated but not appreciated by Alaska's all-Republican congressional delegation, who warned President Barack Obama, in a letter sent Tuesday, against closing off more waters to drilling. But Obama has made it clear that he would rather listen to Alaska Native groups than to the state's elected officials. In 2015, he became the first sitting president to visit Alaska's Arctic, and he has spoken extensively about protecting the region from the results of encroaching climate change. The executive order closely mirrors requests brought to the White House this year by the Association of Village Council Presidents, Kawerak, Inc. and the Bering Sea Elders Group. Central to the executive order issued by the White House Friday are orders to require a greater voice for Alaska Native tribes who want to protect the water that's central to their subsistence lifestyle. The requirements make a clear statement of where the White House stands when it comes to Native Americans opposing oil and gas developments, such as in the controversial case of the Dakota Access pipeline. 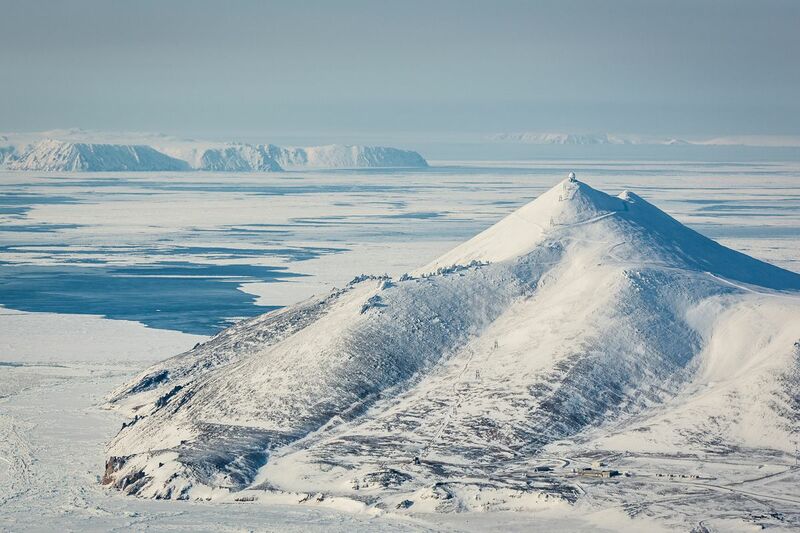 The area set up for increased federal protections Friday is generally considered "Arctic" by the federal government, though it mostly falls just below the Arctic Circle, in the land and waters around the Bering Strait. The new changes released Friday will likely require some effort for the incoming administration to undo. The president's executive order closes off 40,300 square miles from future oil and gas leasing — the Norton Basin planning area and parts of the St. Matthew-Hall planning area. The areas are in the waters offshore of Nome and surrounding St. Lawrence Island. These areas were not included in the most recent five-year leasing plans issued by the Department of the Interior, "so there will not need to be changes to those plans to reflect the withdrawal," the White House said in a statement. Natalie Landreth, senior staff attorney at the Native American Rights Fund, said the move to block off those areas to drilling effectively closes the door on a 1987 U.S. Supreme Court ruling in Amoco Production v. Village of Gambell, which left the area an unlikely source of oil and gas development, but without any long-term clarity in the situation. The communities there wanted the White House to "protect us from having to oppose lease sales every five years for the rest of our lives," Landreth said. The area being blocked off to drilling was not offered in the lease sale in the recent five-year plan and there haven't been any lease sales there since 1985, Landreth said: "It's been offered several times and there have been no takers." 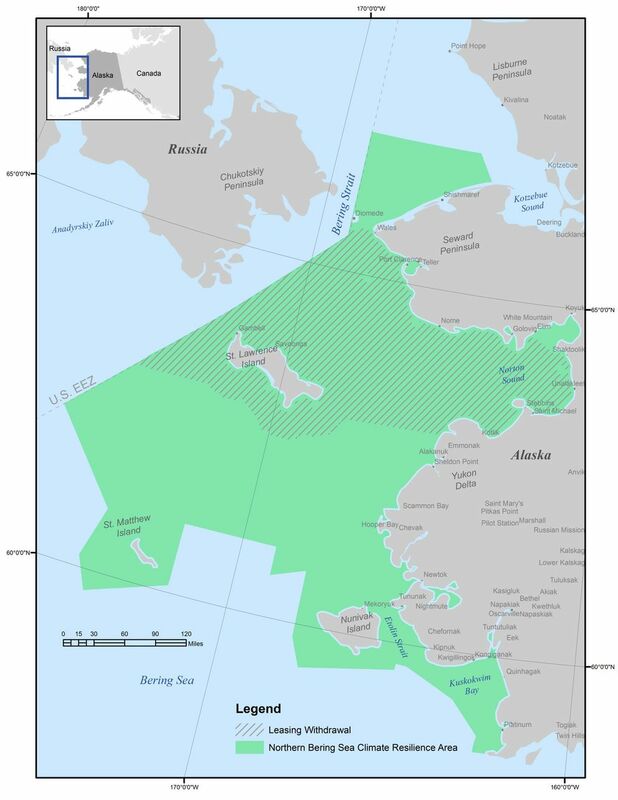 The executive order came not just with oil and gas leasing restrictions but with creation of a 112,300-square-mile area — named the "Northern Bering Sea Climate Resilience Area" — where a task force will help coordinate federal activities "focusing a locally-tailored collection of protections related to oil and gas, shipping and fishing," the announcement said. The goals of the task force include conserving natural resources and a subsistence culture for the more than 40 Yup'ik and Inupiaq tribal organizations in the area. The president has also ordered federal agencies to consider traditional knowledge in its actions and set up a formal consultation program to employ the input of regional tribal governments. "The idea of having a tribal representative body provide advice is a real leap forward in terms of self-determination," Landreth said Friday. "Make no mistake … they're thinking about the Dakota Access pipeline" and trying to make sure Native groups have substantive input in protecting their nearby waters, she said. The intergovernmental tribal council is the move that the Native groups have high hopes will outlast the incoming Trump administration, even if the rest of the executive order does not, Landreth said. In the summer of 2015, not long before Obama came to Alaska and visited Alaska Natives in Kotzebue, many people just south of the Arctic Circle were becoming increasingly worried by talk of increased shipping in the region. Warming oceans mean that the sea ice takes longer to freeze and suddenly the Bering Strait seems like a viable option for a major shipping route. At a meeting in July 2015, someone said, "Let's ask for some help from the president," according to Landreth. "Half the room laughed and said, 'What a Hail Mary,'" she said. The details of the executive order line up quite closely to the requests made in a Bering Sea Elders Group resolution signed by 32 tribal elders on June 15. It also reflects resolutions shared with the White House by the Association of Village Council Presidents and Kawerak, Inc., a consortium of 20 tribes in the Bering Strait Region. The Alaska Federation of Natives issued its support for the executive order Friday, saying that it drew from several key resolutions related to Arctic shipping, addressing climate change and its impacts and boosting Alaska Native involvement and co-management with the federal government in the Arctic. "AFN is encouraged by the effort to raise the role of Alaska Natives tribes and organizations affected in decisions which affect them directly," said Julie Kitka, AFN president. "It is another step in a long process to address the critical economic, cultural and subsistence food security needs of our people." The next step is greater investment in the Arctic, Kitka said. AFN also expressed appreciation for an announcement Thursday that the Department of Commerce had sent a team to Nome to help identify ways to diversify and expand the economy there, and the Obama administration's announcement of $30 million in private donations for scientific endeavors in rural Alaska and Canada. Alaska Gov. Bill Walker said Friday that while he supports the efforts of tribal leaders to protect their resources and find economic opportunities, the state government is worried about new moves to limit oil and gas drilling "at a time when the state is grappling with declining oil prices and production. We are concerned about the timing and lack of clarity on how this executive order will be implemented in the coming years." The move comes a day after Alaska's all-Republican congressional delegation — Sens. Lisa Murkowski and Dan Sullivan and Rep. Don Young — sent Obama a letter objecting to any use of the Outer Continental Shelf Lands Act to withdraw offshore waters from future oil and gas leases. "The Governor of Alaska, the leadership of the North Slope and Northwest Arctic Boroughs, the majority of the tribal leadership representing Alaska Natives who live in the Arctic, a supermajority of the members of the Alaska State Legislature, and an overwhelming majority of the Alaskan people also oppose the withdrawal of acreage in these areas," the lawmakers wrote. On Friday night, the delegation argued that the executive order amounted to more regulations that could lock up future resource development in as-yet-untold ways. Of the 112,000-square-mile climate resilience area, Murkowski said: "We have no idea what that designation is supposed to mean, what legal authority it is supposed to rest on, what the limitations for it will be, or what it will mean for subsistence, shipping, fishing and other activities in Western and northern Alaska." She suggested the move was a back-door monument in the making. "While I strongly support meaningful consultation with tribes, this opens the door to a whole host of unknowns, and could easily be misapplied to block even the most responsible Arctic subsistence, activities and development," Murkowski argued. Sullivan said that Obama's move would, "with the stroke of a pen," hurt Alaskans, and decried that the decision was made without public notice or consulting the delegation. "Thank God the Obama administration only has 42 days left in office; we will be working to undo this action come Jan. 20th," Young said. The congressman said he sees the move as "a backdoor attempt to limit certain activities north of the Bering Strait – like future resource development." In the Bering Strait region, a broad consensus is that the communities want help protecting their waters, Landreth said, noting that the previously unpublished resolution by the elders was "unanimous." The request includes protecting the waters from increased shipping in the region, prohibiting bottom-trawling fishing and oil and gas leasing, and establishing a concrete and ongoing method of input for the tribes in the region. In June, a resolution by Kawerak, representing communities in Gambell, Nome, Shishmaref and others, asked Obama to protect the area "so subsistence uses and subsistence practices of the tribes of the Northern Bering Sea and Bering Strait region are sustained into the future." They also asked for a formal consultation role and for help ensuring the region's "economic sustainability." The executive order also tasks the Coast Guard with finishing its "Port Access Route Study" by the end of the month, with "careful consideration to community recommendations regarding environmentally sensitive Areas to Be Avoided," the announcement said. The executive order also calls for the Coast Guard to "move its conclusions to the International Maritime Organization for action by 2018." The group didn't get everything they wanted. The elders asked that the executive order prohibit any discharge from vessels, including "sewage, oil, ballast water, garbage and noxious chemicals or anything else that would harm the ecosystem, wildlife or fisheries." Instead, the executive order required the new "Bering Task Force" to provide recommendations within nine months on a variety of protective actions. The recommendations will include actions to "ensure or support implementation of the International Code for Ships Operating in Polar Waters" on additional measures needed to bar discharges and pollution in the area, after consulting with a variety of groups — not just the Native peoples. "I appreciate the President's announcement because he really listened to us and understands what is at stake for our Tribes," said said Frank Oxereok, the elder representative from Wales on the Bering Sea Elders Group, in a statement. Oxereok and other elders traveled to Washington, D.C., to urge the White House to take action. "The Bering Sea is like our grocery store and we were born knowing the importance of these waters. Our task is to protect it," said Vivian Korthuis, CEO of the Association of Village Council Presidents. She's from Emmonak. While Native groups framed the White House decision as something that resulted from grass-roots lobbying, not everyone was happy with the results. Environmentalist and marine conservation biologist Rick Steiner, in Anchorage, argued that the effort was too little and too late, and that the executive order could too easily be undone by incoming president Donald Trump. Steiner previously pushed the administration to establish the waters as Marine National Monuments though an executive order under the Antiquities Act, which he said would be a more long-lasting strategy. The "designation is something, but clearly not enough," Steiner said. Steiner said it is his suspicion that the Obama administration is "playing political chess with the incoming Trump administration." The president-elect "can undo this executive order, and the Obama folks just set them up to have to do so, or not," Steiner said. But it may not be entirely simple. In 2011, Obama similarly withdrew waters in Bristol Bay from leasing, but that came with a time limit: June 30, 2017. The executive order released Friday has no expiring time frame. The law "provides no statutory mechanism to reverse" the legal "withdrawal" used Friday, according to analyst Kevin Brook with Clearview Energy Partners. That means that rolling back the order could require more legislative or executive efforts than even rewriting the current five-year leasing plan — something that's expected to take two years. The Native task force and a requirement to update the area's oil spill plan could be undone easily, Brook said, but "it it remains unclear to us whether, in the absence of a statutory mechanism for doing so, Trump could rescind the withdrawal itself." Trump may try, but he'll most certainly run into lawsuits. Correction: An earlier version of this article misquoted a letter from Alaska's congressional delegation to President Obama. The lawmakers said that "an overwhelming majority of the Alaskan people also oppose (not 'propose') the withdrawal of acreage in these areas."